8 Ways to Pay Rent- Which Is Best? Tenants have many options for paying their rent, but as a landlord you should not necessarily accept all forms of payment. Some payment options are difficult to document, while others present challenges with confirming if the funds are actually available. Learn eight different ways tenants can pay their rent and the best and worst ones to accept as a landlord. Cash- Do not allow your tenants to pay their rent in cash. The tenant can claim they have given you the full rent amount in cash, but you may realize they are $20 dollars short when you actually count the money. This is especially dangerous if you allow a tenant to leave an envelope of money for you. If the full rental amount is not in the envelope, it will be a he said vs. she said dispute with no way to prove how much cash was actually in the envelope. If a tenant insists on paying cash, make sure it is carefully counted and that a paper receipt is generated each month to document the transaction. Credit Cards- Do not allow your tenants to pay rent using a credit card. First, you will usually have to pay some sort of a transaction fee to the credit card company. Secondly, the tenant always has the opportunity to report this charge to their credit card company as fraudulent, leaving you with no payment until the situation is rectified, hopefully in your favor. Direct Deposit Into Your Banking Account- Do not allow tenants to directly deposit their monthly rent into your banking account because this involves you having to give them your account number and your routing number. If they are able to put money into the account using this information, they are also able to take money out of the account using this information. While most people are honest and would not commit this type of crime, it is not worth the risk. Especially since there are other, more secure, methods of collecting rent. The following form of rent payment can seem OK until you go to deposit the check and get a notice that there are not sufficient funds in the account and the check has bounced. Personal Check- Although I would not recommend accepting personal checks from your tenants, many landlords still do. With personal checks, there is no way to verify if the check is real or if the funds are available until you try to deposit the check and it does not actually clear. 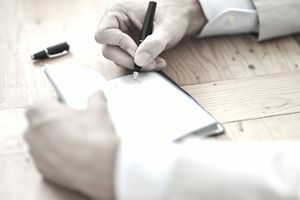 Once your tenant has established a payment history using a more secure method, you may decide to accept personal checks since they have built up the trust level. The following are four ways that tenants pay rent that are the best bets for landlords. These methods are easy to verify and are more secure. Certified Check- A certified check is issued by a bank. It will state that the tenant’s bank account has the necessary funds available at the time the check is written. However, there is no guarantee that those funds will still be in the account when you go to actually deposit the check. Therefore, this form of payment is more secure than a personal check, but not as secure as a cashier’s check. Cashier’s Check- A cashier’s check is very similar to a money order. However, there is a larger fee associated with a cashier’s check and they are only issued by a bank where you actually have a bank account. The bank will withdraw the funds from the tenant’s bank account and will then serve as guarantor of the amount that the cashier’s check is for. Since the bank is guaranteeing this amount, you do not have to worry about a tenant withdrawing funds from their personal account before you try to cash the check. Money Order- You can usually get a money order at a bank, local post office or another convenience store for a small fee. The tenant had to transfer funds in order to get the money order, so it is like receiving a gift card of rent. For example, the tenant wants a money order for $1000, so they give the post office $1000 in cash. The post office then gives the tenant the money order for $1000, which they give to you. Online- Online payments that do not require you to provide any of your personal banking information to a tenant are a good option. It is quick, the funds usually transfer immediately or within a day or two, and it requires little effort, you can sit on your home computer and watch your bank account grow. There are many online rental payment sites such as ERentPayment, RentMatic, and RentMerchant. New P2P online payments platforms exist and are also smart choices. Avoid those like PayPal which charge a fee. Instead look at Venmo, or to Zelle - which is increasingly popular among banks in the U.S., where you can pay your landlord simply by using their email or phone number.